Even though the East Coast just got another snow storm, I am concentrating on Spring. Of course with the warmer temps come cute accessories: fun shoes, purses and jewelry. I love when stores get in their new inventory for Spring. The colors, the light fabrics, everything! It just makes me smile. I have picked out some of my favorite accessories that I hope to wear this Spring. 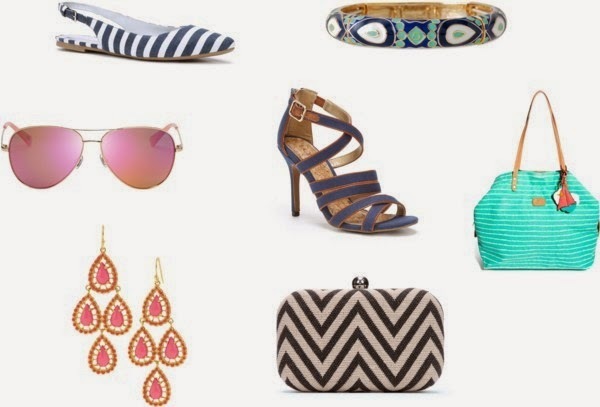 I love the bright colors and patterns included in a lot of these items. Bright colors definitely make me happy when this snow that just won't stop tries to do so otherwise. What items are you planning to add to your wardrobe for Spring? Anything you have your eye on? 2.) Bracelet: Stella & Dot. 5.) Bag: Asos.com (on sale!). 6.) Earrings: Stella & Dot. I'm linking up this post with The Pleated Poppy for What I Wore Wednesday, Style Elixir for Style Sessions and Because Shanna Said So for Random Wednesday. oh, love those loft flats! Those flats are too cute. I added some color legging to my closet for this spring. I love all your picks, especially those earrings. Love the color!